Bangkok Chinatown is listed on many travel guides as one of the tourist attractions for obvious reasons. Maybe because I’m an adopted Australian Chinese, Chinatown has always been on my must see list wherever I go. Every time prior to any overseas trip, I’d Google that country’s China Town and plan and trip there. A meal in China town is a must too! 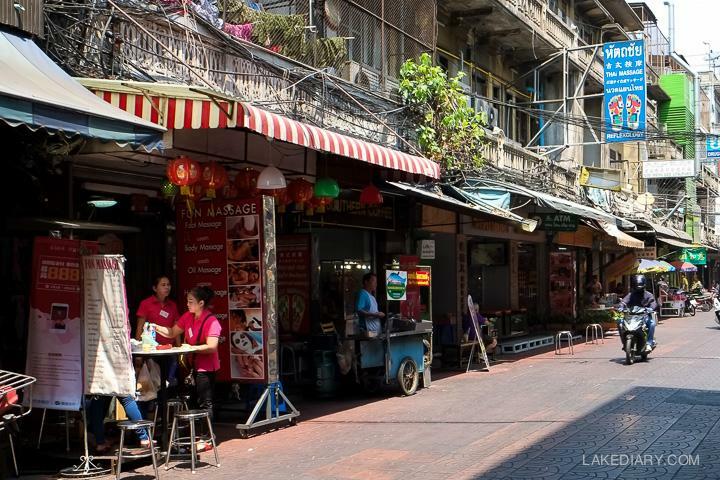 As a keen traveller, I’ve visited many Chinatown in different cities all over the world but Chinatown Bangkok by far offered the most unique and authentic experience. Our hotel wasn’t far from China Town and initially we wanted a “local” treat getting there by tuk tuk, because you have to do that once you are in Thailand right? So we went out on the street around mid day. Immediately we were swapped by many tuk tuk drivers which made me a little uncomfortable. Fear not, I asked how much is the fare to China Town. 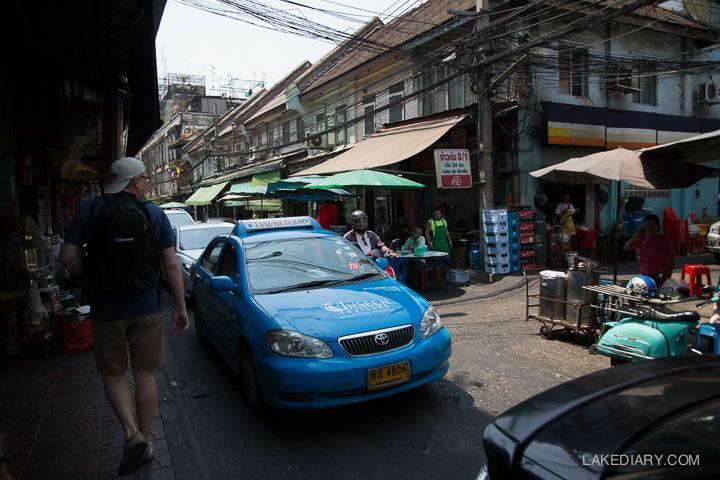 They offered something ridiculous like 4 times more than a taxi fare to Bangkok China Town. We knew the price is negotiable but who had the time and patience to deal with them in a hot day? Besides that, I was sick of being harrassed. As we walked away, one persistent tuk tuk driver follow along. He reduced his price to twice as much as a taxi fair. As we refused to get onto his tuk tuk once again, he said, ” China Town is closed now. It’s only open at night, so you won’t see anything there now.” “Oh really?” I felt disappointed and nearly believed him and stopped trying to go. Yes I’m just someone naive like that. “Yes. nothing.” Tuk Tuk driver replied firmly like a local authority. But lucky I wasn’t by myself and we decided to go and see ourselves anyway. We got there by a taxi. No haggling involved because we simply asked the taxi driver to turn taxi meter on. 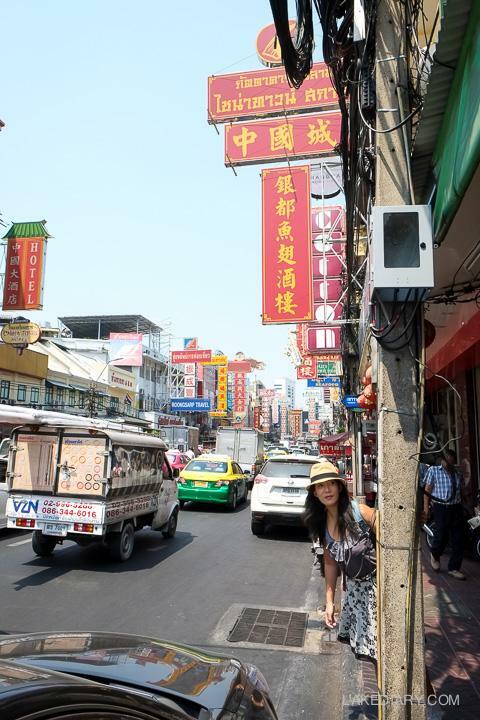 After a short and easy drive, we arrived Bangkok China Town. It was full on! Nothing was closed, therefore the “China Town is closed until night.” wasn’t true. Wonder why a local person would say something like that is not remotely true? Nevertheless, I wasted no time exploring. Bangkok China Town is wonderful and foreign, even to me. Here’s a collection of 15 weird or wonderful things to see and do in Bangkok Chinatown from my personal experience. The list is nevertheless not exhausted. You can choose to see and experience as much as you can or as little you can. The choice is yours! Chinatown Bangkok must have the most shark fin and bird nest shops per square meter in the whole world. I mean, they are everywhere there. I know the old generation of Cantonese love shark fins and bird nest, but until my visit to Chinatown Bangkok, I didn’t realise shark fins and bird nest are loved that much. Have you ever tried shark fin soup or bird nest? I’ve had shark fin soup many times and it tastes like some kind of vermicelli soup. It normally comes as part of a banquet in expensive Chinese Restaurant. I’ve never tried bird nest though. Never had the desire to try – it doesn’t sound edible. Looking back, I should at least try. It’s not as scary as those fried insects! 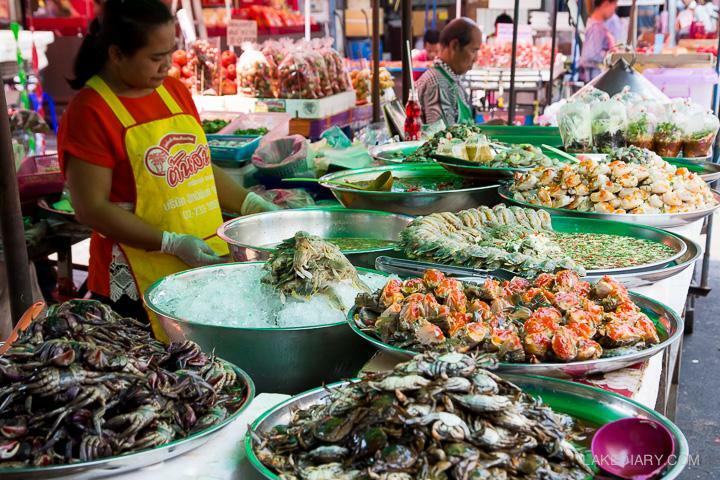 Bangkok didn’t strike me as the city that offers the best seafood but those seafood stalls from Sampeng market certainly left a good impression on me. They reminded me of some seafood stalls in China and Japan, especially China where I grew up. 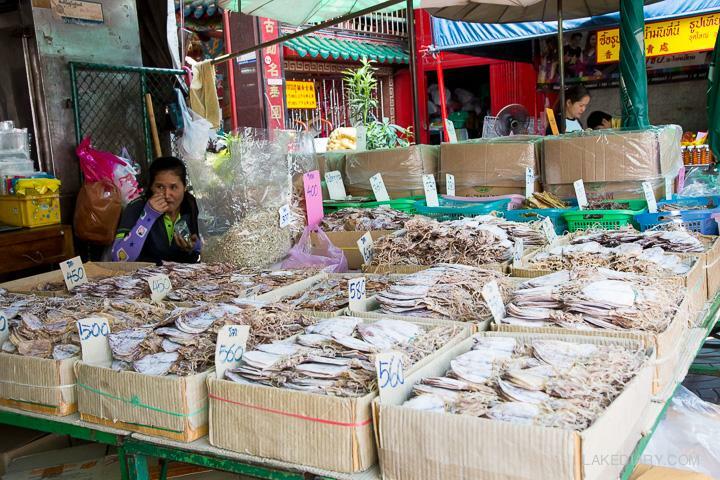 The fresh and dry seafoods of those kind are no where to be found in Sydney Fish Market. We mainly have large sized crabs, boneless fillets and limited kinds of seafood for sale here in Australia. Seafood is getting slightly more diversified in Sydney nowadays because of the hugely increased amount of Asian immigrates in recent years. But markets in Australia are totally different. Look at those crabs with roes! If I had cooking facilities in my hotel room, I’d totally cook them there. Haha, there isn’t of course so I kept walking. Those little dark alley ways didn’t look inviting. They look a little scary actually. It’s quite dark even in broad day light. 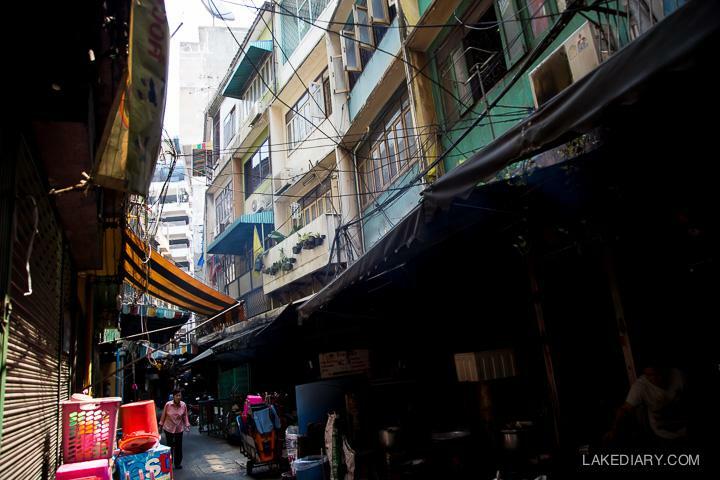 I was hesitant to go that way but to experience the authentic Thai way of life, one must walk through those little dark alleys in Bangkok Chinatown Bangkok in my opinion. We didn’t see any tourist in those part of China Town, only local residents there doing their everyday thing. Perhaps tourists are scared to go in just like I initially felt. We went in anyway because we were curious and kind of brave, lol. 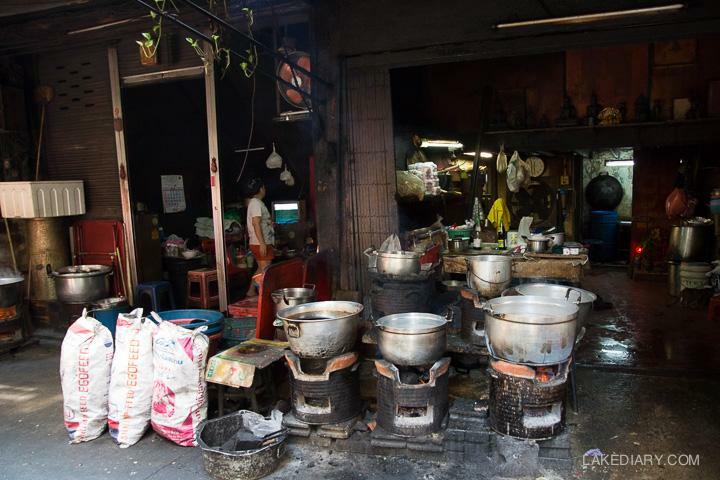 Check out those stoves and pots, you don’t get to see these things anywhere else. One can easily get lost in those dark little alleys ways. But your most memorable experience getting lost in those alleys can be the most memorable experience of your trip. If your stomach is not strong enough and you are cautious about food offered by various street vendors and small restaurants, there are many Grand Chinese restaurants in Chinatown Bangkok for you to choose from. Guess what are most common signature dishes? Yes, that’s right – shark fin soup, bird nest and seafood of course:). This is quite an ancient way to get rid of the facial hair. I’ve heard that in the old days, all Chinese brides had their faces done in this way the first time in their life on their wedding day but not with the white cream on their faces. It was so fascinating to see the procedure in real life especially when it’s so commonly available on the streets. Temples in Thailand are like churches in Europe. They are everywhere! As if there are not enough temples in Bangkok already, there’s a famous temple right in Chinatown – Wat Traimit. Wat Traimit hosts the world’s largest golden Buddha so indeed it’s quite worthwhile to visit. I personal love seeing temples and Buddhas because I’m a sucker for anything old and beautiful. Every tourist attraction you go, it’s guaranteed you’ll find lots of souvenir shops. I don’t buy much souvenirs nowadays because I’ve accumulated enough junk over the years. While in Bangkok China Town, I discovered a secret. Now I’ll share the secret with you: If you want to bring some typical Thai souvenirs back home, don’t buy them from the usually tourist attractions, buy them from the Sampeng Market in Chinatown Bangkok. No only you can find endless choices there, you’ll also get the best value for your money because Sampeng Market is a wholesale place for retailers. Even the retail price there is much lower than what you can get from any other tourist places in Thailand. I was really happy with my hat purchase. 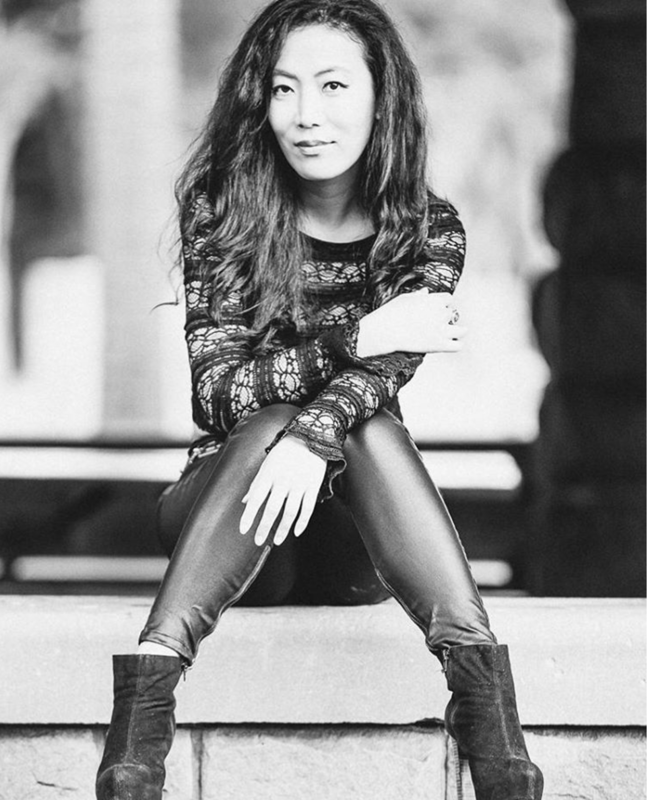 So why don’t I look happy in this picture… too hot? 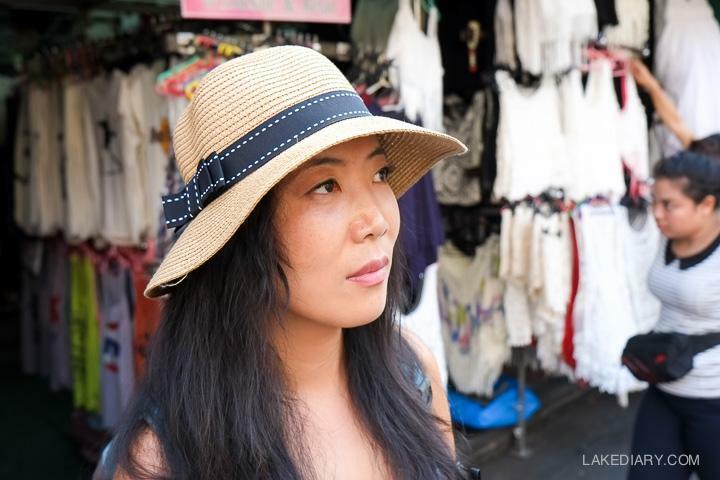 You’ll need a hat in the hot sun in Thailand. I knew I was going to buy some new hats in Bangkok but didn’t have any idea about where to buy them from, until I came across this hat shop in Chinatown. 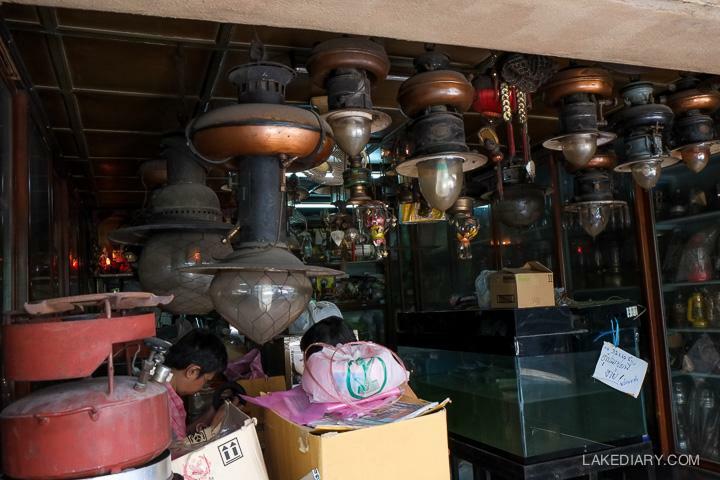 It was located in one of the alleys in Sampeng Market. The size of the shop was huge compared to many little stalls and shops and it was very busy serving retailers from everywhere in the world. If I have a shop boutique, I’d buy from them too! Spoilt with choices, I ended up buying 3. Seriously, if I’d buy more if time permitted. There was no need to haggle, the asking retail price was still only half as much as you buy from other tourist shops after haggling. It made me wonder how low the wholesale price would be. J also bought a pair of the most comfortable pyjama pants made of good quality cotton. We didn’t manage to find something similar anywhere else afterwards. 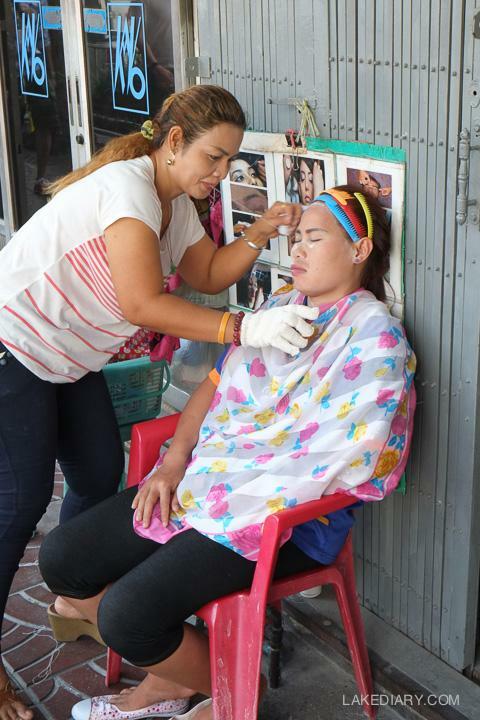 After half day of sight seeing and shopping, you might want to stop for a massage. Why not? Thai massage is world famous and in Chinatown Bangkok. Of course there are good one and not so good ones. The good news is you can get the good traditional Thai massage easily in Chinatown. 10. Sharing the narrowest streets with cars and motor bikes. Exploring Chinatown is not going to be a leisurely stroll. The streets and alleys are so narrow and you have to share them with many cars and motor bikes. How spoilt are we in Sydney Chinatown where the streets ( much wider and neat ) are blocked for pedestrians only! You’ll find fried insets in Bangkok China Town. People generally call them “exotic food” or “delicacies”. Do you think I’d try them because of their fancy names? Of course not. 🙂 I consider myself quite adventurous when it comes to food, but there’s no way in the world that I’d like to ever try those fried insects. There are many gold shops in Chinatown Bangkok – almost as many as the shark fin and bird nest shops. Want to buy gold as pure as 96.5%? 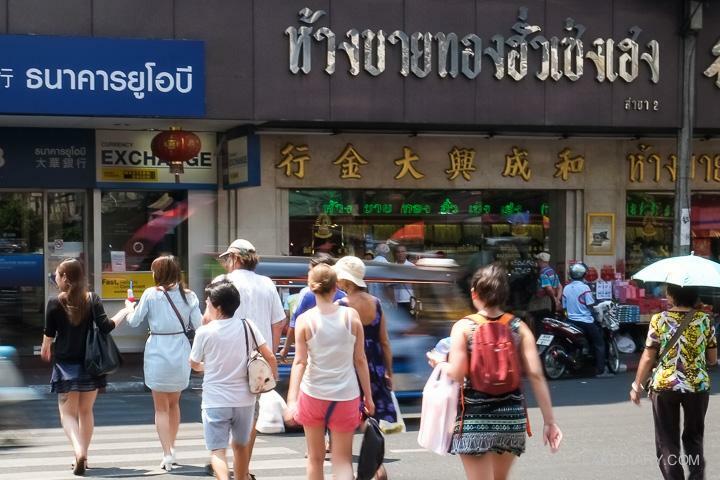 There is no better place to buy in Bangkok other than Yaowarat Road,Chinatown and one of the most reputable along this road is Hua Seng Heng. You won’t miss it wandering around Chinatown. Intriguing name. It’s no longer called that I believe and it’s no longer selling the stolen goods. For those who are curious, the market closes at 6pm and provides interesting objects for photography. If you think Chinatown is busy during the day, come at night and see what “busy” really means:). 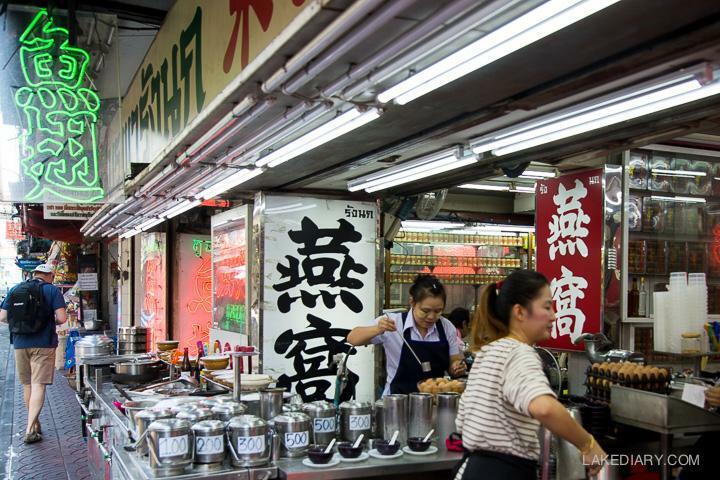 Cooler air, abundant food, neon lights, night markets, bars, and night clubs will welcome you in open arms. Feeling tired after a day’s exploration and in need of a little chilling out time? There’s a rooftop bar in Chinatown too! 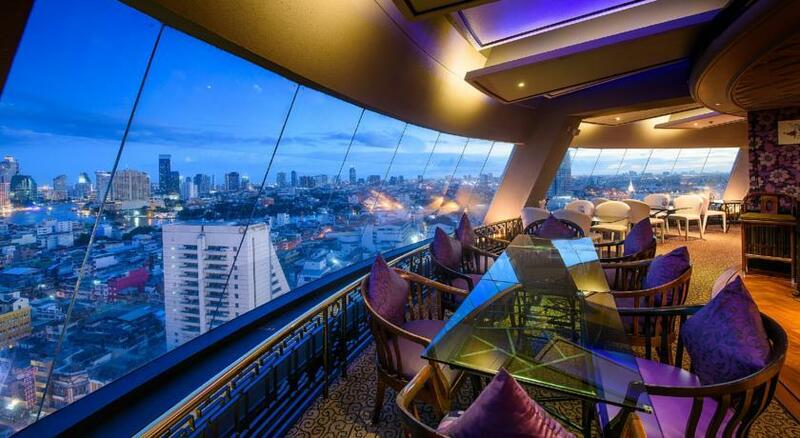 The top floors of the Grand China Princess Hotel Bangkok offers brilliant view of surrounding attractions sites such as Wat Arun Golden Mount and Wat Traimit. For less than 100 baht, the cost of a drink including a draft beer at 75 baht only, you get the view of Chinatown and beyond, all the way to the Chao Phraya river at Sky View 360˙Restaurant Rooftop Bar and Restaurant. It is located on the revolving top floor of the China Princess Hotel and it takes about two hours to complete a full round. What a perfect to unwind and chill after a hot and busy day.